It's a timeless region with ancient roots. Here the Etruscans and then the Romans flourished for centuries leaving behind important traces in the Etruscan cities of Populonia and Roselle and many archeological finds around the region. Then the Aldobrandeschi clan arrived and ruled in Maremma during the dark era of the Middle Ages leaving behind high towers, castles and walled towns such as Santa Fiora and Sovana. The Medici and Lorena families also lived here, as the massive Medici wall in Grosseto remind us. The Medici actually started the land reclamation of the marshes in Maremma that ended only after the Second World War. Talamone is a charming fishing village, with its historical center dwarfed by the ancient castle of the Aldobrandeschi clan which offers great views over the Silver Coast. It is an attractive Tuscan seaside destination surrounded by the Natural Park of the Maremma. 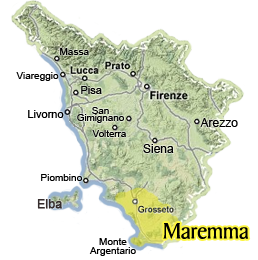 Whatever you plan to do during your holidays in Maremma, you'll do it! This area in southern Tuscany offers a quite endless list of things and activities to do open air - like horseback riding and mountain biking - as well as water sports and excurions amidst nature (Talamone, for example, is a popular destination for all kite and wind surfing passionates). If you prefer relaxing on the beach and sun bathing or enjoying a few beauty treatments or the natural thermal water benefits...well, you'll have plenty of choice as well! Situated between Grosseto and Montepulciano, the town of Sorano will surely enchant even the most seasoned of travellers. Maybe it will be the unexplained paths carved deep into the Earth, the abandoned town of caves or the way the city emerges out of living rock. Taste the flavors of Tuscany and visit the Wine Road in the Maremma and Montecucco. This area of southern Tuscany has lots on the menu to savour while on vacation: wine, cheese, chestnuts, honey, saffron and homemade deliciousness. Capalbio is a charming medieval village in Maremma overlooked by the Fortress of the Aldobrandeschi and imposing, ancient walls from which you can admire a breathtaking landscape of the Maremma area. Planning to spend time in the Maremma? Here are some highlights that should be on your list of "must-sees"while exploring including the best seaside and beaches, the picturesque villages and its culinary traditions. Mystical and exciting, the stone carved town of Sovana, offers up an itinerary filled with churches, secret roads, and good food. Follow our insider ideas how to get the best out of your trip in one of the prettiest cities of “Tuff” stone. Follow the perfumes and flavors of wine and food products from the Maremma area in southern Tuscany. Even if your vacation is focused on the sandy beaches of the area - you can still enjoy a few wine tastings and more! Saturnia is a beautiful town in Maremma famous for its thermal baths, the sulphurous waters well-known for their therapeutic properties. In addition to the spa centers, the outdoor waterfalls are freely available to the public. The Locanda nel Cassero is a small charming restaurant in the medieval hilltop village of Civitella Marittima in the "upper" Maremma, serving regional and local specialties.